Thankful Tree ~ This Thankful Tree is a sweet centerpiece you can craft ahead of time — and it’s perfect for teaching kids what Thanksgiving is really about. To make it, get branches from your yard or local florist (I used curly willow) and cut paper leaves from construction paper. 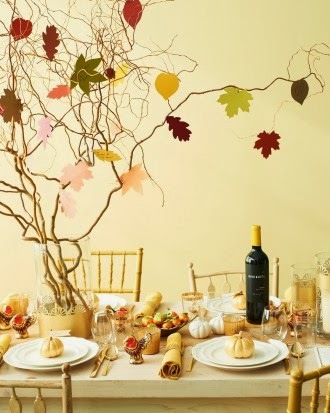 You’ll just need a small piece of double stick tape to attach the foliage to your branches. 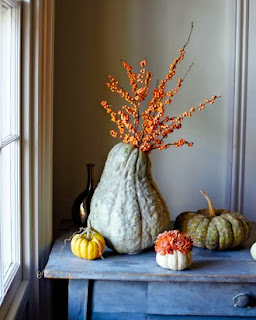 Easy Fall Arrangement ~ Vases made from squashes and pumpkins are simple to make and decorate beautifully. To make one from a large squash such as this one, cut a hole near the top with a miniature saw and insert a glass jar in the neck to hold water for bittersweet or other branches. You may also need to trim off some of the squash's bottom to stand it upright; a bit of waxed paper underneath will protect your tabletop. For petite varieties such as the white 'Baby Boo' pumpkin, insert a small glass votive candleholder to hold water for cuttings of mum heads or other bulbs. 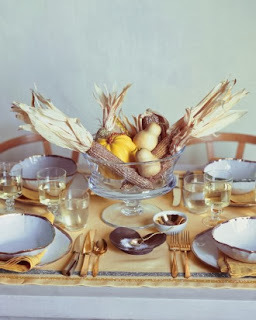 Golden Harvest Thanksgiving Table ~ A few organic elements, enlivened with a bit of gilding, evoke fall's abundance.It starts with the basics. The dishes, with their fluid forms, conjure up the natural world. The silverware is sturdy, and it shines gold, silver, it doesn't matter, so long as there's a gleam. Stripes of glitter on the edge of a table runner add to the festive feel. For an eye-catching centerpiece, turn a glass compote into a horn of plenty with glittering Indian corn and squash. The trick is to vary the intensity of the sparkle by covering some ears completely and using the glitter sparingly on others. The squash needs nothing more than a glittered stem to shine. 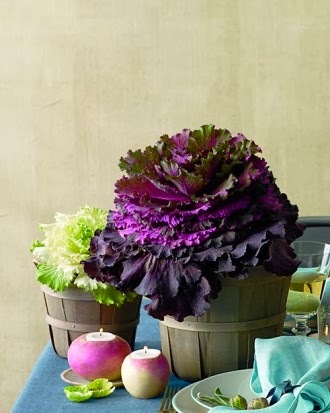 Gray-Washed Cabbage Basket ~ Place cabbage in a basket for a stunning pop of color! 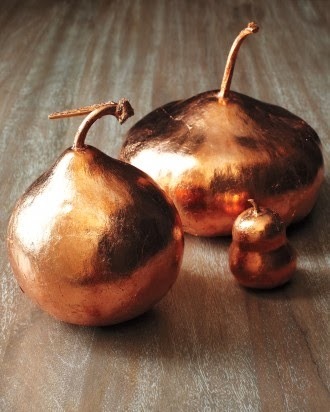 Copper Leaf Gourds ~ Upgrade a fall gourd to create an inexpensive Thanksgiving table centerpiece. Apply water-based sizing (glue for gilding) with a foam brush to a dried gourd. Let dry until clear, about 20 minutes. Wearing cotton gloves, drape a copper leaf sheet over gourd, and smooth with fingertips. Burnish with a soft-bristle brush. Continue until gourd is covered. Let dry 24 hours. 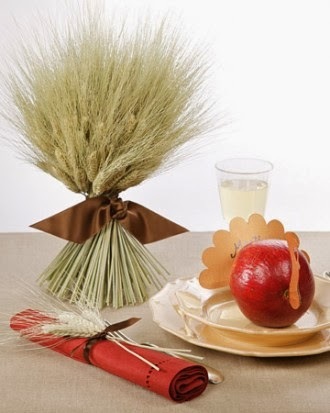 Wheat Sheaf Centerpiece and Napkin Ring ~ This wonderful craft will make any holiday table beautiful. Spread wheat bundle on a flat surface. Pick up a few stalks and hold them in the crux of your hand, just below the grain pods. Add stalks, one at a time and on an angle, to the bunch in your hand, lining up the tips. Move your hand down the bunch as it widens. When all the wheat has been used or you can't hold any more, secure bunch in the middle with a rubber band. Trim the ends of the stalks with scissors so they lie even. Tie ribbon around the waist of the sheaf. Tie half a double knot with a length of ribbon around a rolled napkin. Lay three pieces of wheat on the knot, and finish the double knot. Trim ends of ribbon on an angle. Cut ends of wheat to desired length. Harvest Napkin Ties ~ Squirrels aren't the only ones who can tap an oak tree's potential. 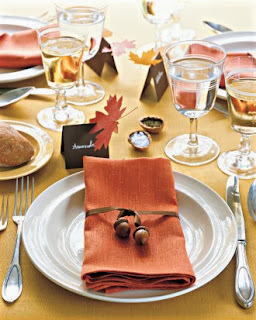 For pretty napkin ties that evoke the harvest season, attach store-bought acorns to satin ribbon. If the acorns aren't precut, separate the cap from the body of each acorn with a craft knife. Make a small hole in cap with an awl. Knot one end of a 9-by-1/4-inch brown satin ribbon. Thread other end through a cap; knot at top. Thread through another cap; knot on both sides. Reattach bodies.